I appreciate all the feedback I’ve got in emails, on this blog and on other blogs. Especially, I’m thankful for critical feedback as this is helping me in addressing important issues. 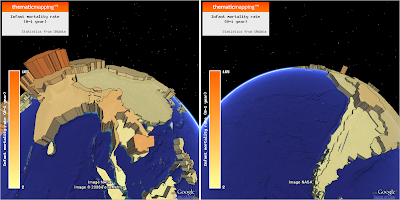 Most of the critical comments are questioning the effectiveness of 3d globe visualisations, which are widely used on this blog. We definitely need to think critically about the pros and cons of 3D visualisations. I want to give my response in a series of blog posts. 1. I’m using two visual variables (colour and height) to represent the same statistical indicator. This makes country comparison easier when spinning the globe. 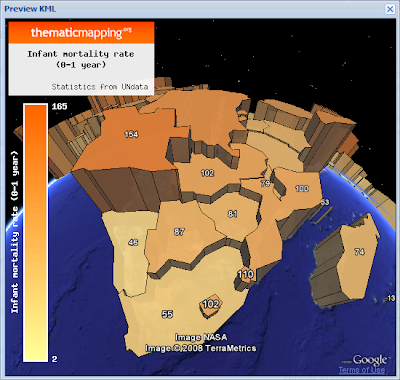 I could not find oil consumption statistics at UNdata, so I'm using "Infant Mortality Rate" instead (per 1,000 live births). You can make the map in the Thematic Mapping Engine, or download the KMZ file here. I think this is a good and effective 3D visualisation. 2. Values can be displayed on the globe, which makes country comparisons much more accurate. I added this feature to the Thematic Mapping Engine yesterday. More info will come in a separate blog post. 3. Another option, which is now possible with the new Google Earth plugin, is to have two spinning globes in the same window. Click here for a live example (based on the China Syndrome example from Google Code). If you rotate the left globe, the right globe will show you the view on the other side. I think it would be better to enable the user to rotate the two globes indepentantly. 4. A different approach is leave the globe, but hold on to 3D KML using a tool like UUorld, where you have 3D prisms on a flat world map. Currently, there are no 3D KML renderers that are able to make such visualisations, but I’m sure there will be in the near future. Maybe a job for the UUorld guys? UUorld seems to use Plate Carrée (Equidistant cylindrical) projection. This is clearly not the best choice for thematic world maps, but it’s the same projection currently supported by KML (EPSG:4326). In conclusion, country comparisons are problematic on a 3D globe, but it shouldn’t stop us from doing it! While I agree with where Rich is coming from, the reality is even highly-educated scientists who should know better use inappropriate symbols for their maps'. The biggest problems, in my opinion, are associated with interpolated rasters of density ('heat maps' and other names), which lead the viewer to make all sorts of invalid conclusions about the data they are viewing. 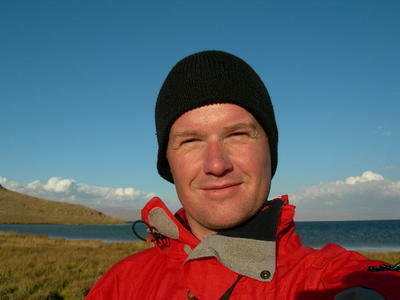 Hi Bjorn, your work is really amazing. I follow your blog since a couple of months. We are talking about tools and, thus I don't want to start a flame war :). I like GE but usually I develop with WorldWind Java and I think it is another good alternative. Thanks for your feedback. I think you're WWJ application looks very promising and I think it's always good to have open source alternatives. I didn't know that you could make prisms on a "flat" map with WWJ. Maybe WWJ is the backend of UUorld? Do you know if WWJ has any KML support? It would be great if I could visualise my thematic maps with WWJ! KML not for the moment, but integrate it (now is an OGC standard) into WWJ would be great. Respect flat globes, yes the WWJ teams has developed different kind of globes: sphere and flat (with some different projection options). I'm very busy but I would like to spend some time trying to read basic KML elements and draw it with WWJ. Antonio, please keep me updated if you're successful in integrating KML with WWJ. Libkml might be useful. @Antonio, Nice work on the WWJ prism maps. Looks like there's a lot of potential there. @Bjørn, I'm one of the developers at UUorld. To answer your question -- we don't use WWJ. Our engine has been written from scratch. If people need KML outlines of administrative boundaries in the United States (everything that is TIGER), I have a free and open source program (TGR2KML version 2) at http://tnatlas.geog.utk.edu/. It will clip out major water polygons if you wish. 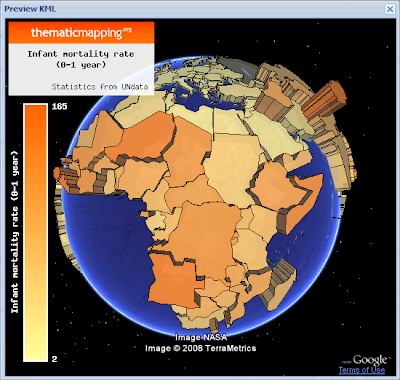 Along with a student, we have a thematic mapper page at http://ctasgis02.psur.utk.edu/tokml. Have a look. I haven't seen what you're doing before. Great work.